Note: Facebook recently removed this feature from its ad platform as it produced unreliable data. It looks to be in reworks and we will keep you posted once it's live again. Social media management has become an increasingly competitive field and since the release of the business.facebook suite and the ads.facebook suite within it the options for reaching users has expanded tremendously over the last 5 or so years. Having all these options are great for marketers as they can target users in various places on Facebook and with the adsuite, they are able to create multiple campaign variants to test out which messaging and concepts appeal more to their audience. Facebook ad campaigns can be a powerful tool for your marketing efforts but when you have to combine it with your external site's analytics and performance it can quickly become messy if you do not employ good housekeeping. In order for Google Analytics to properly attribute traffic and to classify various campaigns, you need to make use of UTM tracking. While helpful it is a seriously manual process and can lead to plenty of human error. You can make use of URL builders online or create one for yourself in excel but it still requires you to manually upload them into each campaign you create on Facebook. If you're a social media manager that specialises in performance, you'll know exactly how painful and time-consuming creating and tracking campaigns can be. Thankfully Facebook has made it easier to track your campaigns with the help of dynamic URL parameters. URL parameters make it easy to categorize and understand the effectiveness of your ads. For example, you can use URL parameters to identify where your ad traffic is coming from and which ads helped drive a conversion. Insights from URL parameters can show which link people clicked to get to your ad's destination, like to your website or Facebook Page. These parameters will automatically pull in campaign details you specify, add it to your UTM tracking and push it through to your Google Analytics. 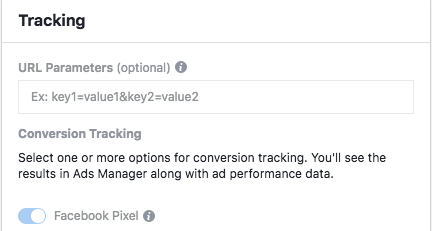 You can add URL parameters to your Facebook ads during the ads creation workflow. URL parameters can be placed on ads that link to destinations off Facebook, such as your website, or on ads that promote existing Facebook posts. If you're adding URL parameters to an existing Facebook post and it links to a website URL off of Facebook, your URL parameters will only apply to URL clicks on the ad and not on clicks that may happen if someone sees the post organically and clicks a link. Hopefully, this makes your life a lot easier and wasting time adjusting naming conventions and help you have more consistent tagging and cleaner data going forward.